I do not have the full document from which these statements were lifted to properly understand the nuance lying behind them. If I have misapprehended the intent of such statements, then I trust someone will correct my misunderstanding. They are, however, by themselves suggestive and apparently sufficiently clear for @T4GOnline to post without context. As they are, and as they reflect a well worn sentiment, they invite comment. Though we would not quibble with the basic assertion that mere profession is not what unites us with the saving work of Christ, we must ask, “How is such possession measured?” It would seem to be a fundamentally important question. If one’s only hope for eternal salvation, if one’s only confidence for the forgiveness of sin, if one’s only assurance that the death of Jesus was in fact efficacious for me, is my possession of faith, then how do I know that I possess it? What if I’m only fooling myself into thinking I have it? How can I know that I possess this thing apart from which I am eternally lost? As a pastor, this is a question asked often of me. It is asked by those who profess love for God but wonder if they are fooling themselves and fear they lack possession of what they profess. In fact, they read such tweets and walk away with their confidence shaken (such that those who make such statements might consider the weight of millstones before tweeting). If possession is 100% of gospel hope how then can one be sure of possessing what is needed for salvation? With such questions we leave the comfortable world of theological assertion and enter the messy world of real people making the real journey from the City of Destruction to the Celestial City. The question being asked is, “How can I know that I am saved?” The answer to that on which I have been nurtured has been that our assurance rests on a three-legged stool: the certainty of the Word of God, the evidence of a changed life, and the inner testimony of the Holy Spirit. But as I shepherd real people (indeed as I navigate my own life) I find that though they believe the Bible (leg #1), they see so little change in their lives (leg #2). This uncertain holiness tends to muffle inner assurances (leg #3), leaving them to wonder if the voice they hear assuring them of their sonship is not the Holy Spirit at all, but some other intent on leading them to damnation. These are sensitive and lovely people who are not helped by the clever turns of phrase that make for good tweets telling them that their profession is meaningless in the larger scheme of things. Essential inward trust cannot be known without public profession. Merely external words do not save anyone, but neither does a purely inward faith. In fact, contrary to the tweet, it is not our faith at all that transfers us from the kingdom of darkness to that of the light, but our Savior. This he does by living, dying, and rising again, all in which we take part through our union with him. We take hold of Christ by believing in our heart and by confessing our trust in him with our mouths before the church and by being marked with the covenantal sign of baptism. Christianity is not a mere inner conviction. It is not a private faith. 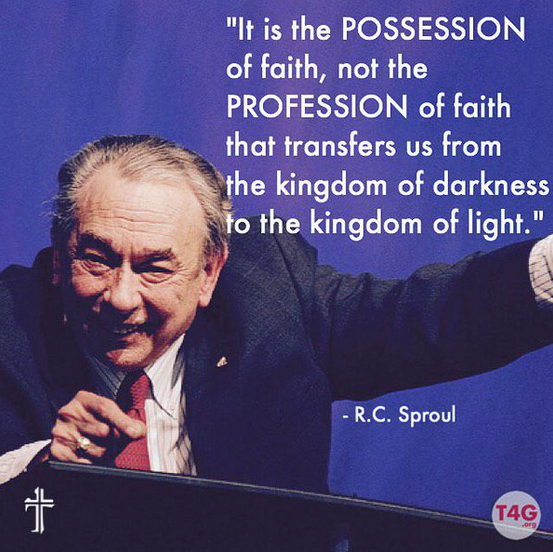 It is covenantal to the core, as Mr. Sproul would, I know, agree. The hope of our eternal salvation is dependent solely on Christ and not upon my ability to hold on to a pure inward faith. Jesus holds on to me even when my heart is broken and shaken and weak. When people question their salvation and look about for some word to assure them that they are secure, as sheep often do, it does no good to ask them to look into their hearts to see if they possess faith. That is the very question they are asking. And it does no good to ask them to scan the works they have done, because being sensitive they will see their lives littered with the remains of promises broken, holiness marred, love denied. Ask them to listen to the inward voice of the Holy Spirit and all they might be able to hear is someone screaming “hypocrite” deep within them. They can find no solace by an inward examination. But we can ask them to look elsewhere. They can look to that time when they professed faith, publicly embracing Jesus Christ as he is freely offered in the gospel. And they can look to the mark they bear, the sign of God’s covenant faithfulness applied to them, the sign of baptism. By these things they can see, and are MEANT to see, that they have been marked by God as belonging to him not by what they have done, but by what he has done for them. By looking at these objective signs, they can see that, so united with Christ, they are secure in the heavenly places with him. They can, in fact, look to their profession and their baptism and their relationship to the body of Christ, the church, as objective signs of an inner reality that, though oft assailed, is nevertheless real. And they can rest in that when all other subjective measures slip through their fingers like dry sand. It is the possession of faith that unites us with Christ, of that there is no doubt. But a possession so often assailed is fortified by a sign and seal of God’s promise that he who professes faith will be saved. On that I can rest. On that those who post such things rest. I just wish they would let others rest in this as well. For similar thoughts, more carefully expressed, from someone with actual credentials, see this. Appreciate your thoughts on this. I still haven’t figured out why so faith is so broadly interpreted.